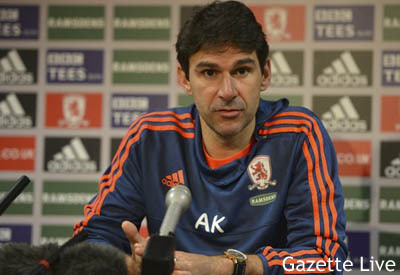 If I could have posed a question to Aitor Karanka at this week's press conference, it would have been this. "At this stage of the season, do you let our rivals' results and playing styles affect you personally, or do you remain wholly focused on the job in hand at all times?" It is a question, I feel, that needs to be asked in relation to the frustration that surely enters many a Boro fan's mind when our promotion rivals' win at the most irritating of times, in a manner we seem incapable of emulating. Under Karanka we have regularly seen fit to either win matches by taking the lead or not win them at all, while our competitors appear to either blast away teams with a swagger or pull impossible escapes out of the bag when they have looked set to lose. Last season we managed four goals against Charlton and Blackpool at home. Watford managed three times as many. We also strolled to a 2-0 win over Birmingham, only for Bournemouth to mercilessly quadruple that tally at St. Andrews. And when they went 2-0 down to the Blues at home later in the season, we must have thought we'd gain some valuable ground on them. Then Callum Wilson and his penalty winning "skills" bailed them out. Something similar happened last Saturday for Brighton against Charlton - two goals in the last ten minutes turned around a 2-1 deficit just when Boro thought it was safe to assume top spot would still be theirs. Cue potential hurt and disappointment, brought upon by another team enjoying the position of leadership that we would love to be enjoying ourselves. How hard done by we repeatedly feel when a commanding position is snatched from our grasp by external forces. It's a Typical Boro thing. "If they can be that exciting and dramatic, why can't we? ", we may ask. But, despite the scoreline and the way everything unfolded, I don't believe Brighton's win was all that different from Boro's, in a way. Like ourselves, Brighton were given the chance to bounce back from a below par first half, and in the second half, they kept knocking at the door until class told, although playing against ten men helped. I am aware that an apples to apples comparison can't be made here, as, with due respect to the Addicks, an away fixture against Ipswich is a much sterner test than a home fixture against Charlton these days. I am merely suggesting that we need not be discouraged by how our rivals win when everything is still there to be won. The race to join the Premiership has been very topsy-turvy so far, and will continue to be so. Furthermore, those who score lots of goals don't always win. What did Brendan Rodgers' swashbuckling Liverpool of 2014 have to show for their efforts? The key, I think, is to keep the pressure on everyone until it is mathematically impossible to succeed. In 1998, we didn't think Sunderland could throw away a four point advantage over Boro. But they did. And Bryan Robson's men built their success on - wait for it - a solid defence. Perhaps it is not so much about relying on other results as laying down the gauntlet, a challenge, to our rivals. A "we've won, and won well, so let's see if you can do better" mentality. We aren't going to win every game. And neither are they. That's something to be remembered as we now look to build upon our superb second half display at Ipswich by giving the Blues the blues. Something we can do, and do well - because that's what AKBoro at their best are all about.